Early Neolithic, 6000–5500. The first appearance of food-producing cultures in the south of the future Linear Pottery culture range: the Körös of southern Hungary and the Bug-Dniester culture in the Ukraine. With the transition to the Neolithic, "... the female principle continued to predominate the cultures that had grown up around the mysterious processes of birth and generation." The LBK, therefore, did not bring anything new spiritually to Europe, nor was the cult in any way localized to Europe. It is reflected in the vase paintings, figurines, graves and grave goods, and surviving customs and myths of Europe. In the north, the goddess could manifest herself as the mistress of animals, grain, distaff and loom, household, and life and death. 1 2 Hibben, page 121. ↑ Klopfleisch (1882), Die Grabhügel von Leubingen, Sömmerda und Nienstädt, in the Voraufgehend: allgemeine Einleitung, section entitled Charakteristik und Zeitfolge der Keramik. Brief recognition of his authorship is given in English by Fagan, Brian Murray (1996), The Oxford Companion to Archaeology, Oxford University Press, ISBN 0-19-507618-4 page 84. ↑ Dolukhanov under External links, Models. The numbers are stated in the abstract. Note that figures such as this although true given the parameters depend on data that was selected by the investigator and are best regarded as approximations. ↑ Gaskevych, Dmytro. (2006). "Vita-Poshtova 2 — New The Easternmost Site of The Linear Band Pottery Culture". Sprawozdania Archeologiczne, Vol. 58, pp. 205–221. ↑ See the article The Interaction Between Early Farmers and Indigenous People in Central Belgium included under External links, People below. 1 2 3 4 5 KRAP (2007) under External Links, Places. ↑ Hertelendi and others (1995) under External links, Places, especially page 242. 1 2 Gimbutas (1991) pages 35–45. ↑ Archived 4 February 2007 at the Wayback Machine. 1 2 3 4 Baldia (2006) The Earliest Bandkeramik..
↑ This article does not have space for all the names, but they can for the most part be found in the sources. ↑ Baldia (2003) Starcevo-Koros-Cris under External links, Places. ↑ External links, Places. These numbers are their 1σ range. For the tolerances, see the article. 1 2 3 Hertelendi and others, External links, Places. ↑ Price, pages 13–16, gives an overview of the theory's development. ↑ The article by Kertész covers the research on the area and the concepts of hiatus and barrier. ↑ Dolukhanov and others (2005) pages 1453–1457. ↑ Clark & Piggott, pages 240–246. 1 2 Haak, Wolfgang (2010-11-09). "Ancient DNA from European Early Neolithic Farmers Reveals Their Near Eastern Affinities". PLOS Biology. 8: e1000536. doi:10.1371/journal.pbio.1000536. Retrieved 2013-11-19. ↑ Gimbutas (1991) page 38. ↑ The crop and weed information is indebted to Kreuz and others, cited under External links, Economy. ↑ 2002, External links, People. ↑ 2003, under External links, Economy. ↑ A brief discussion of tools is to be found in Gimbutas (1991) page 39, and a fuller presentation with pictures of the tool kit in Lodewijckx & Bakels (2005) under External links, People. 1 2 The numbers are from Gimbutas (1991) pages 39–41. However, they are approximately the same as the numbers given by other researchers and can therefore be taken as true measurements within a tolerance. 1 2 3 Marciniak, Chapter 1. ↑ Krause (1998) under External links, places. ↑ "Archaeological Research at Oslonki, Poland". Princeton.edu. Retrieved 2013-04-23. ↑ "Linearbandkeramik Culture - The First Farmers of Europe". Archaeology.about.com. 2013-01-17. Retrieved 2013-04-23. ↑ Baldia (2000) The Oldest Dated Well under External links, People, describes an LBK well. ↑ Gimbutas (1991) page 143. ↑ Orschiedt (2006) under External links, Places. ↑ James Chapter 1 page 13. ↑ The reader may find a thorough recapitulation in Davidson (1998), whose chapter titles the above list repeats; however, the topic has received attention from many noted scholars and writers. ↑ The works of Gimbutas listed in the Bibliography are sufficient to give the reader an overall view of her study. However, those interested in an immediately available comprehensive view from a Gimbutas supporter may access Marler (2005) under External links, Models. ↑ An outstanding advocacy of complexity can be found in Hayden (1998) cited under External links, Models. Hayden discovers some of the limitations of Gimbutas' thought. His view was answered in detail in Marler (1999), External links, Models. The reader should be aware that all of Gimbutas' career was surrounded by controversy, perhaps fueled by sexist allegations and counter-allegations. Nevertheless Marler and Hayden are professionals with something valuable to contribute, as are Renfrew and other protagonists of Gimbutas' ongoing debates. ↑ This section is heavily indebted to Gimbutas (1991) pages 331–332. Christensen, Jonas (2004). "Warfare in the European Neolithic". Acta Archaeologica. 75 (142,144, 136): 129. doi:10.1111/j.0065-001X.2004.00014.x. Clark, Grahame; Piggott, Stuart (1967). 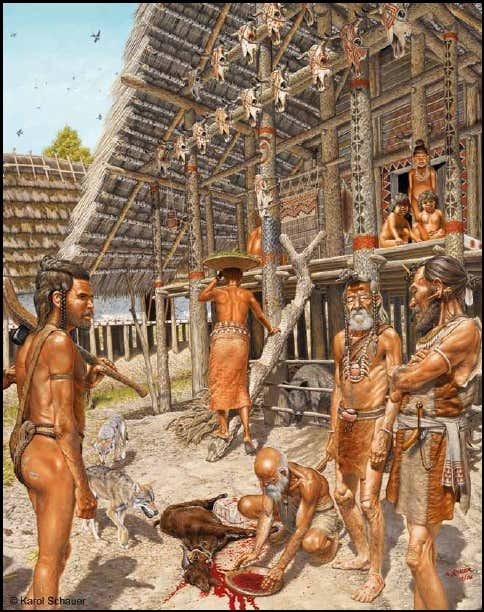 Prehistoric Societies. New York: Alfred A. Knopf. ISBN 0-14-021149-7. Davidson, Hilda Ellis (1998). Roles of the Northern Goddess. Routledge. ISBN 0-415-13610-5. Gimbutas, Marija (1982). The Goddesses and Gods of Old Europe 6500–3500 BC: Myths and Cult Images: New and Updated Edition. Berkeley, Los Angeles: University of California Press. p. 27. ISBN 0-520-04655-2. James, E.O. (1994). The Cult of the Mother-Goddess. New York: Barnes&Noble. ISBN 1-56619-600-0. Renfrew, Colin (1990). Archaeology and Language : The Puzzle of Indo-European Origins. Cambridge University Press. ISBN 0-521-38675-6. Price, T. Douglas (2000). "Europe's First Farmers: an Introduction" (PDF). In Price, T. Douglas. Europe's First Farmers. Cambridge: Cambridge University Press. ISBN 0-521-66203-6. Hardcover Softcover ISBN 0-521-66572-8. Bocquet-Appel, Jean-Pierre (August–October 2002). "Paleoanthropological Traces of a Neolithic Demographic Transition" (PDF). Current Anthropology. 43 (4): 637–650. doi:10.1086/342429. Archived from the original (PDF) on 18 October 2005. Hertelendi, Ede; et al. (1995). "Re-Evaluation of the Neolithic in Eastern Hungary Based on Calibrated Radiocarbon Dates". Radiocarbon. 37 (2). Archived from the original on 14 September 2006.